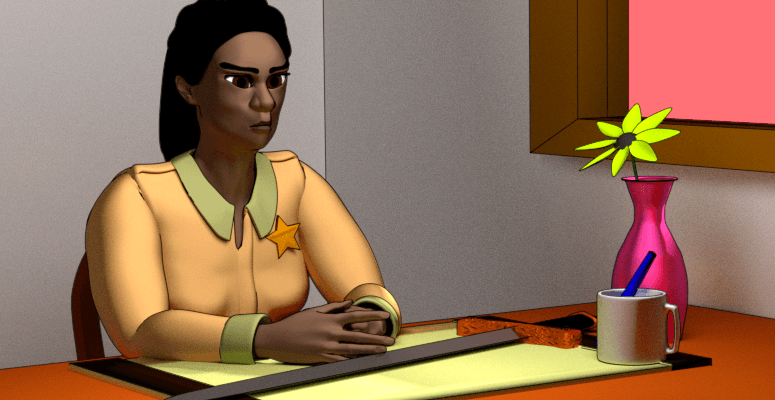 The Sheriff was a large woman with a severe face and a tight ponytail. She glared down at Eddie and Bryce from over her desk. "Where'd you come from, boys?" "Um, out in the desert," Eddie said. "There's no desert out west," the Sheriff said. "Have you been there lately?" Asked Eddie. A sword lay across her desk, its metal gleaming in the light of an open window. Eddie studied it's ornate pommel. Its blade was thick and solid. "Is that sword yours?" he asked. "Never mind that. Earlie tells me you drove up into town in that contraption of yours." "Is that against the law?" Bryce asked. "Right now, what's against the law is whatever pisses me off," she said. "First our town gets warped into the shape of a baby rattle, then people start disappearing. I don't know where they go, but I'm guessing it all has to do with freaks like you." "Why do you wear the sunshades, boy? You blind?" Eddie glanced nervously at Bryce, who shrugged. Reluctantly, Eddie removed his sunglasses. He waited for the Sheriff to go crazy and shoot him. Instead, she only scowled harder. "I want answers. What's happened to our valley? What's happened to Bixbyville? My runner says it's not there anymore. What happened to our mayor? He's either been abducted, or he's just plain disappeared. A few other folks, too." "Did a dragon take them?" Eddie asked. She slammed a fist on the desk. "I don't want to waste time here. Either tell me the truth or I'll put you in jail." Bryce put up his hands. "Wait. We don't know anymore than you do. My friend and I, we woke up in the desert. We don't know how we got there." "Uh-huh. And where'd you get that carriage of yours?" Bryce stared at her. "Why do you say that?" "Because I have a knack for knowing when folks are lying." She pointed at Bryce. "You are a liar." "But I woke up in the desert. And I don't know how I got there. Am I lying about that?" She stared hard at him. "If you are, I can't tell. That doesn't mean I believe you." "So there's no way we can convince you we don't know how your town got this way or what has happened to this world." She sat back in her chair and sighed. She turned to Eddie. "What about you? What's your story?" "What he said," Eddie said. "I found myself in the desert a few days ago. I have no memory before that.."
The Sheriff's eyes narrowed. "But you do know something." He shrugged. "I don't know what I know. I've sort of got amnesia." "It's true. Or... it's kind of true." She stared hard at him. "You're the first drifters that speak English, but you've got nothing I want to hear." "There have been others?" Bryce asked. "Sure. Had quit a few of them running amok until I started throwing them in the slammer. 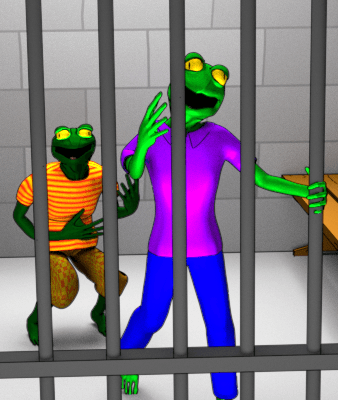 Now I got a couple of guys in the pen that are half frog. Creepiest thing I've ever seen. They talk gibberish. There's a little girl with gray skin who doesn't say much, but whatever she's speaking, it sure isn't English. Then there's the woman who hasn't spoken a word since Earlie picked her up. They're all in the pen till I get answers that make sense." "Eddie here is a translator," Bryce said. "He can talk to them if you'd consider letting us go." The Sheriff studied Eddie. "This true?" Eddie gulped. "So far, it has been." She stared at him a moment longer. She stood. "Okay, son. Let's see what you can do." There were two jail cells down a short hall behind the office. Eddie followed the Sheriff between them. On one side, there were indeed two men who looked like they were half amphibian. One wore a polo shirt and jeans. The other had a t-shirt and Bermuda shorts. Their skin was green, their skulls frog like, with huge eyes and gulping mouths. "We need water, now," one of them insisted, reaching a shaking hand through the bars. "What'd he say," asked the Sheriff. Eddie noticed how dry their skin was. "They need water. They will die if they don't get it soon." The Sheriff looked from Eddie to the frog men. "Earlie," she called over her shoulder. "Yeah," the deputy called from the front office. "Fetch a couple buckets of water." "Don't ask me why," she shouted. "Do as you're told!" "It's on its way," Eddie told the frogs. "What language did you speak?" the Sheriff asked. Eddie shrugged. "Their language, I guess." Bryce said, "He doesn't know what he knows until he knows it." She turned to him. "Do you know why the world's gone to blazes?" In the opposite cell, a little gray-skinned girl sat huddled in the corner, her knees pulled up to her chest, her head bowed. She wore a simple brown shift, ornate decorations lining the bottom hem. 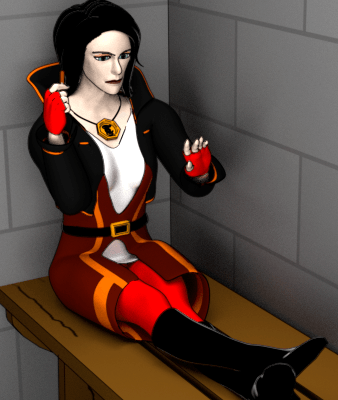 On a bench on the other side of the cell, a woman lay propped against the wall. Eddie's first impression was that she dressed like a starship captain out of a fantasy movie. She filed her nails, barely glancing up as they regarded her. "Well, you're here," the Sheriff said to Eddie. "Start translating." Eddie blinked. "What do you want me to say?" "Start with, 'Hello.' Then move on to, 'What the hell are you doing in my town?'" Bryce spotted the woman in the cell. "Can I start with her?" he asked. "Do you translate too?" asked the Sheriff. "Oh, I think we can reach an understanding." He grasped the bars and gave a roguish smile. "Hey, what's up? I'm Bryce." The woman continued on her nails as if he weren't there. "Are you deaf? Because if you are, I know the sign language for 'I love you.'" The woman rolled her eyes and continued filing. "She speaks English," Eddie said. "So it would seem," said the Sheriff. "Why don't you start with the frog boys. Ask them how they got here." Eddie did. The frog in the polo shirt gasped. "Can't talk. Need water." "Then let's talk to the girl," the Sheriff said. Eddie was startled to find that the little girl now stood staring up at him. She clutched the bars, her eyes fixed on his, her expression a mixture of desperation and hope. 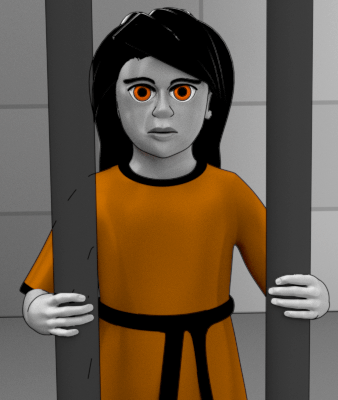 "Why do you have a little girl in jail?" Bryce asked, annoyed. "We've got nowhere else for her," the Sheriff explained. "They won't take her at the orphanage. The other kids are scared of her. Anyway, I'd like to know where she came from before I can figure out what to do with her." Eddie crouched down in front of the girl. She watched him with rapt expectation. "Hello," he said in English. "I won't be able to talk to you until I know what language you speak. You need to say something." 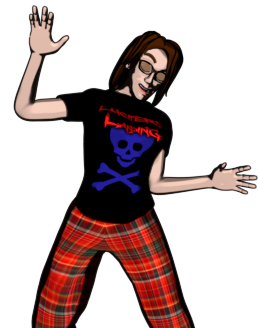 Eddie recoiled, nearly falling backwards. Was she going to freak out like the others? Instead of breaking out in a fit, she continued to gaze at him expectantly. "You know who I am?" Eddie asked. She nodded. "I remember you." "You're the one who said you would rescue me from the bad man."